Wouldn't it be great to buy a printer that comes with a generous supply of continuous ink? Great, because it’s here! 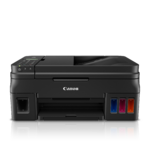 Introducing the Canon PIXMA G3200 Wireless MegaTank All-In-One Printer, an absolute Mega performer. Its MegaTank ink reservoir system allows it to print up to 6,000 crisp black pages / 7,000 magnificent colour pages with the replacement ink bottles1. That’s as many prints as you would get from 30 conventional ink cartridge sets!2 Which means you won’t have to run out and buy ink for a long, long time. It also uses front facing ink tanks that are sleekly integrated into the design, so it is easy to see your ink levels at any time. The result is a clean look and a compact footprint. 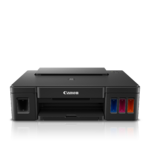 But it’s not just about the quantity of output this printer can produce; it’s about quality too, because the PIXMA G3200 printer utilizes hybrid ink formulations for deeper blacks and more vibrant colours. The PIXMA G3200 printer also lets you connect your favourite mobile devices wirelessly3 or through the cloud4, so it's always ready to go, even when you’re on the go. 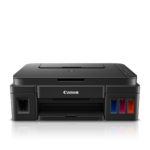 Printing quality and cost-effectiveness have arrived with the new Canon PIXMA G3200 Wireless MegaTank All-In-One Printer. Welcome it home! 1 Page yield of included ink bottles used for initial setup is lower than the replacement ink bottles, as a certain amount of ink is consumed to fill into the print head during the setup (charging the print head initially). Page yield is the estimated value based on Canon individual test method using the ISO/IEC 24712 chart and continuous printing simulation with the replacement ink bottles after initial setup. Page yield of colour inks is an average yield of cyan, magenta and yellow inks combined. Page yield varies significantly depending on content printed and other factors. Up to 6,000 (black) / 7,000 (colour) printed pages yields are approximate, based off document pages printed. 2 30 ink cartridge sets is based on print yield of the replacement black and colour ink bottles as compared to the following standard-capacity cartridge sets: PG-245 Black Ink Cartridge and CL-246 Colour Ink Cartridge as of August 2016. 3 Wireless printing and scanning requires a working network with wireless 802.11b/g or n capability. Wireless performance may vary based on terrain and distance between the printer and wireless network clients. 5 Requires an Internet connection and the Canon PRINT Inkjet/SELPHY app, available for free on the App Store and at Google Play. Compatible with iPad, iPhone 3GS or later, and iPod touch 3rd generation or later devices running iOS 7.0 or later, and AndroidTM mobile devices running Android 2.3.3 or later. Your device must be connected to the same working network with wireless 802.11 b/g/n capability as your printer. Requires an compatible social media account and is subject to that social media accounts Terms of Service. Certain exceptions may apply. 6 Requires an Internet connection and Google account. Subject to Google Terms of Service. Certain exceptions may apply. 7 Document print speeds are the averages of ESAT in Office Category Test for the default simplex mode, ISO/IEC 24734. Photo print speed is based on the default setting using ISO/JIS-SCID N2 on Photo Paper Plus Glossy II and does not take into account data processing time on host computer. Print speed may vary depending on system configuration, interface, software, document complexity, print mode, page coverage, type of paper used etc. Copy speeds are the average of sFCOT and sESAT, ISO/IEC 29183. Copy speed may vary depending on document complexity, copy mode, page coverage, type of paper used etc. and does not take into account warming up time. See www.usa.canon.com/ipm for additional details. 8 Paper types NOT supported for borderless printing are as follows: Envelope, High Resolution Paper, T-Shirt Transfer, Photo Stickers. 9 Works edited by using this application cannot be displayed, edited, or printed without this application. Compatible with Android device of 7 inches or more using Chrome (latest version compatible with your current version of AndroidTM OS), iOS Devices of 7 inches or more using Safari 5.1 or later, Windows PC (excluding RT) using Internet Explorer 10 or later of Microsoft Modern UI version, Microsoft Internet Explorer 9 or later, Mozilla Firefox 31 or later, or Google Chrome version 36 or later, and with Mac OS X 10.6.8 or later using Safari 5.1 or later. 10 "Full HD Movie Print" is available from "MOV" and "MP4" movie files created by select Canon EOS Digital SLRs, PowerShot, and VIXIA digital cameras and camcorders. Requires PC or Mac with Intel® processor and Canon ZoomBrowser EX 6.5 or later or Canon ImageBrowser 6.5 or later for "MOV" files, or Canon ImageBrowser EX 1.0 or later for "MOV" or "MP4" files. Print quality is determined by the video resolution. Function does not upscale video resolution. 11 To install using Windows® OS, .NET Framework 4 is required. Compatible still image formats are PDF (created using Canon PDF Creator only), JPEG (Exif), TIFF, and PNG. Compatible video formats are MOV (from select Canon digital cameras only) and MP4 (from select Canon digital camcorders only). 12 Resolution may vary based on printer driver setting. Colour ink droplets can be placed with a horizontal pitch of 1/4800 inch at minimum. 15 Operation can only be guaranteed on a PC with pre-installed Windows 10, Windows 8.1, Windows 8, Windows 7, Vista SP2 and Windows XP SP3 (32 bit only). 16 Internet Connection required during software installation. For full compatibility macOS v10.12.1 or later is recommended. 17 Some functions may not be available with these Operating Systems. Please refer to manual or our website for details. 18 Requires a Windows RT compatible device and the Canon Easy-PhotoPrint app for Windows RT available for free in the Windows Store. 19 Requires "Canon Print Plug-in" available for free from the Amazon Appstore and an Amazon Fire Phone, Amazon Kindle Fire HD6 or HDX7 device or later running Fire OS 4.0 or later. 20 Warranty programs are subject to certain conditions and restrictions. See www.canon.ca/support for details.